A group of historians found in 1929 at theTopkapi Palace in Istanbul, Turkey, something fascinating. Imprinted on an old Gazelle skin dated 1513, they discovered a segment of an amazing map. This map seemed to depict part of the Atlantic Ocean and included the Americas and Antarctica in perfect detail. 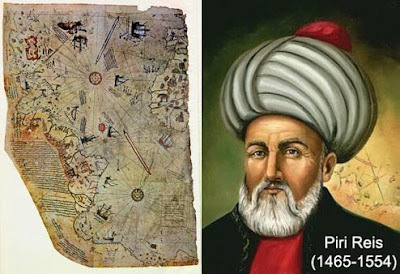 The map came to be named after its creator (Piri Reis) and even now the debate continues. Did Piri Reis was lucky with cartographic guesswork? Or did the Turkish admiral have access to charts and maps created by an advanced race, living on the planet thousands of years ago or something else? Interlocutor: Were there maps at Christopher Columbus’ disposal? I ask it because the historians speak a lot about this possibility. Interlocutor: Well. I won't insist more because I consider this issue properly clarified. This entry was posted at Sunday, January 10, 2010 and is filed under History . You can follow any responses to this entry through the .